Cleopatra Treasures is a video slot game that embraces the rich Egyptian Culture. The civilization depicted in the game keeps the player intrigued to keep hunting for Cleopatra’s Treasure hidden in the game. You can play this game online for free on various websites or at any online casino that has GamesOS/CTMX games to play for real money. Cleopatra Treasure offers 5 reels and 20 pay lines. Set your bet amounts by clicking the ‘+’ and ‘-‘ buttons next to Line Price. Click on ‘Bet One’ to add a line to your bet. The minimum bet per line is 0.05 and the maximum bet is 5. Click on ‘Spin’ at the bottom right corner to start playing. The ‘Bet Max’ button will play with all lines being active. The ‘Auto Spin’ button is also available to play several times in a row. Symbols in this game are similar to those found in similarly Ancient Egypt themed games such as the scarab, a vase, a pharaoh and an Egyptian goddess. They also include card symbols 9,10, J, Q, K, and A.
Cleopatra is the scatter symbol. If you land 3 or more of this symbol, you trigger the free spins feature. 3 symbols get you 5 free spins, 4 symbols get you 10 free spins while 5 get you 20 free spins. The scatters symbol does not have to appear in any particular order to get you rewards. The scarab acts as the wild symbol in this game. This acts as a regular wild symbol which means it can substitute for all other symbols except the scatter symbol. 3 or more golden vases on an active line trigger the bonus round which allows you to go hunt for treasures. Click on any of the 3 vases to receive a random bonus prize. The highest value of reward can be 5. In most cases, you could land 0, 0.5 or 1. This, however, should not deter you from hunting for more prizes to increase your winnings. Cleopatra Treasure has a jackpot worth up to 3000 coins to keep you playing this interesting game. Land 5 jackpot symbols on an activated line and you will get rewarded with a very high payout. The Return to Player rate for Cleopatra Treasure is estimated at 95.9%. You can try playing Cleopatra Treasure slot in demo mode for free to get a hang of the rules before playing for real money. It is available as a mobile slot game on smartphones and tablets running on popular operating systems and can also be played on desktop computers. 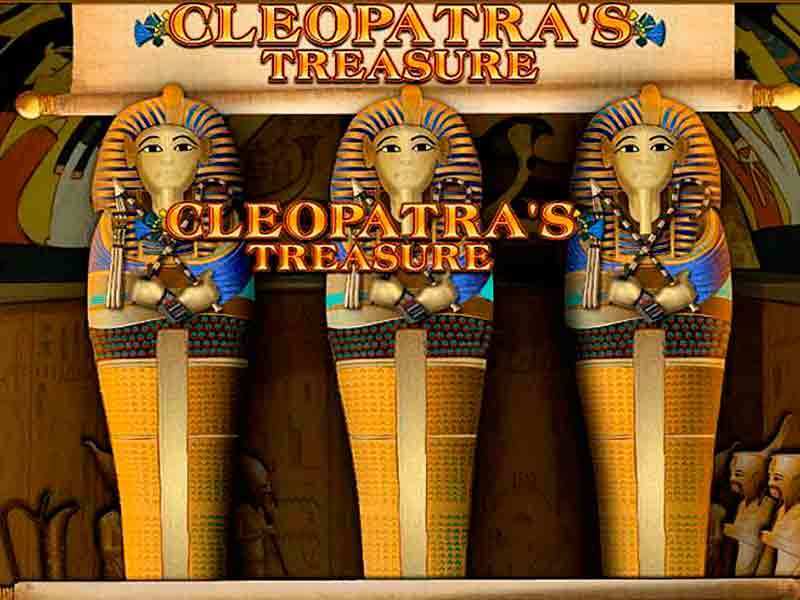 Cleopatra Treasure slot game will not hang when playing making it one of the best gaming experiences available. Play more lines to increase your winning chances in this online slot game. Other than Cleopatra Treasure, you can play more GamesOS games online for free such as Magic of Oz, Gems and the City and Magic pot among others. 0 responses to "Cleopatra Treasure Slot"